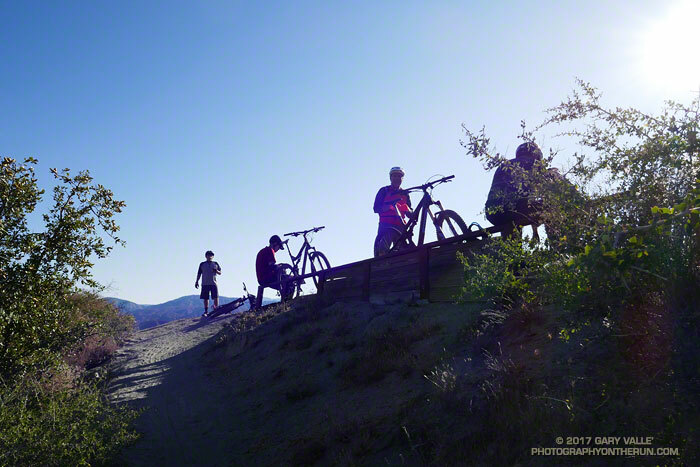 The group of five mountain bikers first passed me at Strawberry Potrero, a picturesque area on the north side of Strawberry Peak. The circuit around Strawberry Peak is a favorite of MTBers and in recent years I’ve encountered bikes on the loop nearly every time I’ve done it. It’s also an excellent run and part of the Mt. Disappointment 50K course. Josephine Peak and fire road. Click for larger image. Stand of Bigcone Douglas-fir that didn’t burn in the 2009 Station Fire. Click for larger image. I thought I’d seen the last of the mountain bikers, but found them taking a break near the beginning of the two mile, 750′ climb to Lawlor Saddle. We chatted about the great weather and the next section of trail. As I turned to continue, one of the riders asked, “Hey, do you need a GU or anything?” I told them I was good, and started running. Mountain bikers expect to be faster than a runner — and they usually are — but there are certain situations where runners have an edge. This was one of them. The first half-mile of the climb to Lawlor Saddle is relatively steep. After that the trail backs off a bit, but is still a decent climb. Since I had a head start, I decided to play the “How Long Can I Stay Ahead of Them” game. I didn’t know if they were going to play or not, but it really didn’t matter. It was a way of having a little fun and motivating myself to push a little harder and run a little faster. Parish’s goldenbush. Click for a larger image. Whether you’re doing the Mt. Disappointment race or not, the climb to Lawlor Saddle will tell you if you are having a good day or bad. Today I was having a good day. The temperature was about 30 degrees cooler than at this year’s Mt. D, and after the initial steep section I ran nearly every step to Lawlor Saddle. A couple of times I thought I heard the bikers behind me, but somehow made it to the saddle without being tagged. But now I was in trouble. Just past Lawlor Saddle the uphill ends. The question wasn’t if they would catch me, but when. Just before the trail turned to the east I caught a glimpse of a bike at the saddle, so the when might be in just a few minutes. It would depend on how spread out the riders were and if they decided to take another break. Hikers on the Strawberry Peak Trail. Click for a larger image. From Lawlor Saddle the trail contours around the south side of Mt. Lawlor for a mile or so, winding in and out of one ravine after another. It’s not particularly technical, but I hoped the frequent turns might slow a bike. I pushed the pace as much as I could. About a mile from Red Box the trail finished its traverse around Mt. Lawlor and dropped down a rocky section of trail to an abandoned Forest Service road. Foolishly I started thinking maybe, just maybe, I’d make it to Red Box ahead of them. The game over, I settled back in for the last few miles of the run. Some related posts: Strawberry Peak, Switzer’s and the Old Colby Trail; Strawberry Peak Circuit; Strawberry Peak Summit Loop. Holly-leaved cherry, a favorite of coyotes and black bears in Southern California. ** The location of Josephine Saddle is currently mismarked on Google Earth and Google Maps. The saddle at the top of the Colby Canyon Trail has long been known as Josephine Saddle. It is marked as such on the U.S.G.S 7.5 Minute Condor Peak Quadrangles from 1959 to 2012. It is called Josephine Saddle in John Robinson’s authoritative guidebook Trails of the Angeles and numerous other guidebooks and route descriptions.